Yes, I upgraded from Debian Lenny to Squeeze because I need ibus to replace scim as my default Chinese input program. So far the experience with ibus is good but the same was half-true with Squeeze. I spent quite some time to make Squeeze more comfortable to use. Compiling and installing it is fairly easy. You just need to have kernel-headers and build essentials (gcc, libc, make, etc). You do not need the kernel source to compile this kernel module. Find the workable voltage for your CPU. You can use rmclock in Windows to select the voltage and write down the number or search the Internet for the limit of the undervolting for your CPU. 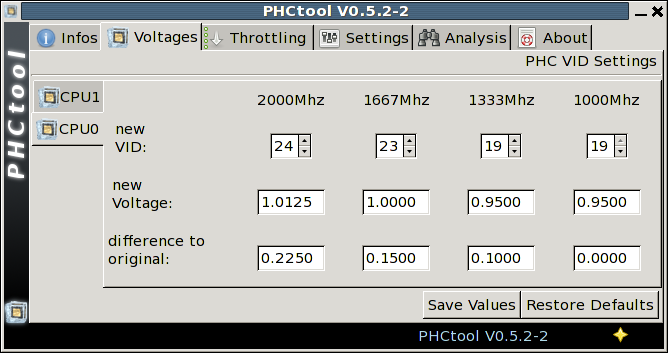 Use PHCTool (old version) to convert the voltage into VIDs (voltage IDs) for Linux PHC. I have little luck with underclocking Geforce Go 7200 on my HP DV2000t laptop. By the way, this laptop is very hot and noisy so I don’t think I am gonna buy a HP lappy again. I basically followed the instructions by Artem and ended up putting the following lines into my /etc/X11/xorg.conf, but I am not sure if it worked or not. Maybe I should change the driver and try again? Option         "RegistryDwords" "PowerMizerEnable=0x1; PerfLevelSrc=0x3333; PowerMizerDefault=0x3; PowerMizerDefaultAC=0x3"
ibus works great under Debian Squeeze. Just remember to run ibus-setup first and enable the pinyin input method for ibus to handle. 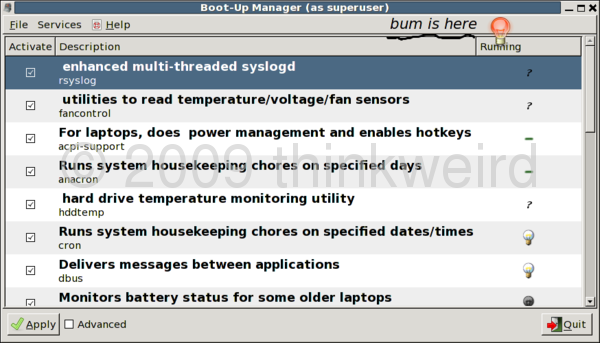 Bum (Boot-up Manager) is a great tool to view the system services and disable them. It is better than rcconf and sysv-rc-conf. The screenshot was taken by shutter under gnome. shutter is quiet powerful to use and its plugins can perform almost everything you want in a screen capturer. But it’s still a diamond in the rough because I struggled a little bit trying to find the resize function under this program. It turned out that resizing is supported by a plugin and it hides under the ‘screenshot’ menu. The screenshot of bum above is a an art of creation by shutter. Install python-mutagen package first and then run this command in the directory of the mp3 files. Java based program ID3iconv is also know to perform the same task. Right now I am using Exaile as the music player. Too bad it does not allow me to sort music by directory sources like foobar in Windows. More to come about the movie/music player and other cool stuff under Linux.